When it comes to health care, the United States of America has a problem – a big problem, and the CGNFS was developed in part to help alleviate this huge (and growing) problem. What is this problem? It’s an acute shortage of health care professionals, especially nurses, and it’s getting worse every year. Why is this occurring? That’s easy to answer; it’s happening because the US population is rapidly getting older. After World War II, millions of military soldiers returned home and began starting families. This led to a huge increase in the birth rate for several years, generally considered to be from 1946-1964. Americans born during this time frame are known as the Baby Boom generation. Prepare with our CGFNS Study Guide and Practice Questions. Print or eBook. Guaranteed to raise your score. Get started today! Well, America now finds itself with 10,000 people a day reaching the age of 65, and this is going to continue for nearly 20 more years. This is unprecedented in the history of the world, and America’s health care system is going to face severe strains as we struggle to keep up with the health care needs of this generation. Senior citizens are the biggest consumers of health care, by far. What makes this problem even worse is that we already had a nursing shortage; this is only going to exacerbate the problem. CGNFS is helping the nation address this growing shortage of trained nurses. CGNFS stands for Commission on Graduates of Foreign Nursing Schools. It was created in 1977 at the behest of the federal government, which was responding to widespread concerns that many nurses immigrating to the US weren’t adequately trained up to our standards. So, originally it wasn’t meant only to address the nurse shortage in America, but also to make sure that nurses from other countries had adequate training before being allowed to practice in America. CGFNS Flashcards. 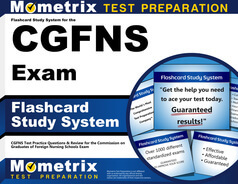 Proven CGFNS test flashcards raise your score on the CGFNS test. Guaranteed. Without the efforts of the commission to evaluate the quality of foreign nurse training programs, create standardized requirements for foreign nurses, and test incoming foreign nurses before allowing them to work, the current nursing shortage would be far worse than it is. They make sure that nurses from other countries are not only properly trained, but also speak English well enough to communicate with patients and other health care workers. The CGFNS has been so successful with screening foreign nurses that they also screen audiologists, speech pathologists, physical therapists, occupational therapists, lab technicians, and laboratory scientists from foreign countries.